I’m taking a break this weekend, unplugging my computer and spending the next couple of days with my family and friends. Holidays were meant for relaxation and making memories. 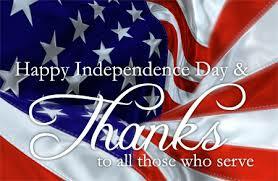 So, to all of you, I send you wishes of a safe and happy 4th!. Close the laptops, remember all who fought and served to give us the freedom we celebrate. Be safe and have fun. Love you guys!